My daughter and I had a fantastic adventure in August/September 2010. Our hardworking guides -- Newtie, John, Shad, and Jace -- were outstanding. 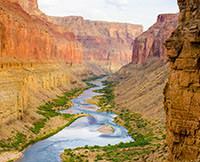 So knowledgeable and informative about the geology of the Grand Canyon and the history of the Colorado "river rats." Even if some of the stories were tall tales! We had perfect weather, great food, fun companions, and E-ticket rides all the way (The younger folks will not get this reference, but the older ones will). Even when we were not getting splashed, it was great. J ust floating down that beautiful canyon -- so quiet and peaceful -- was a thrill in itself. The camps were superb, and the hikes into the side canyons, particularly Havasu, breathtaking (Literally -- the water was REALLY cold compared to the air temperature!). And the stars at night, after the lights in the camp went out. What a spectacle. How lucky we all were to have found Western River Expeditions for this experience. If I am ever fortunate enough to have another chance to raft the Colorado River through the Grand Canyon, it will be with Western River Expeditions.